Where is recorded video stored? Verkada's standard option includes enough on-camera storage capacity for 30 days of continuously recorded video. For longer retention needs, Verkada offers cameras with enough capacity for 60, 90 and 120 days of recorded video. 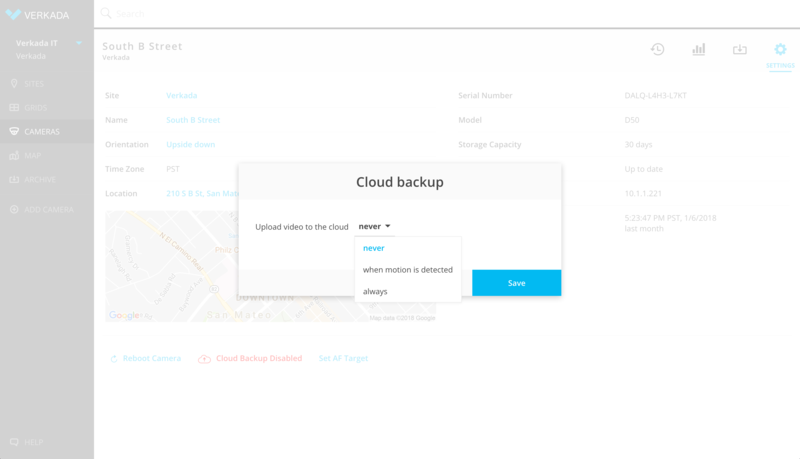 Beyond this, Cloud backup is available on a per-camera basis for an additional license fee. To minimize the impact on your LAN, these backups can be scheduled to occur during off-business hours, e.g., between the hours of midnight and 4 am. It's also possible to choose to backup video all the time or only when motion is detected.